ERMA FIRST S.A. was established in 2009 by a team of specialists with strong background and expertise in waste and water treatment technology in Marine applications. 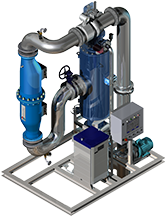 Driven by the Maritime needs and legislation, and monitoring the Environmental Protection challenges, the company started designing and manufacturing Ballast Water Treatment Systems. Being successfully tested in the most prominent test facilities, the ERMA FIRST systems are certified and have been awarded for technological achievement many times through the years. ERMA FIRST BWTS FIT holds USCG Type Approval, Final Approval by IMO and Type Approval by LR. Nowadays, ERMA FIRST has a prestigious reference list comprised of ship-owners and shipyards worldwide.